Finding the time and energy to squeeze in a few solid workouts during the week can feel like a full-time job unto itself, especially when you're also trying to get to Taco Happy Hour. There's a good reason 80% of the New Year's Resolution crowd almost immediately quits going to the gym. 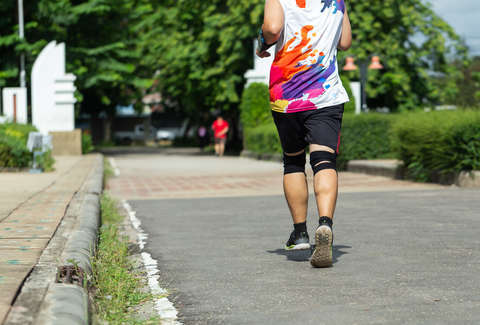 In fact, so few Americans make exercise a priority that less than a quarter of adults are getting enough of it, according to a new report from the Centers for Disease Control & Prevention. 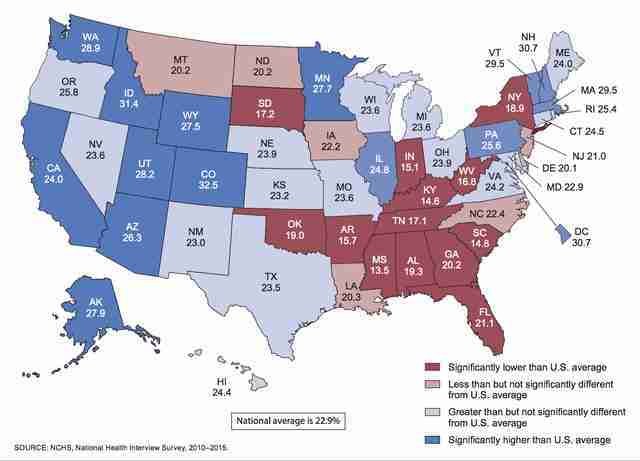 However, people in certain areas are faring much better than others, and now we know exactly which states are getting less exercise than they should be. The new CDC report looked at data on people's diet and lifestyle habits collected via a National Health Interview Survey between 2010 and 2015. Specifically, respondents between the ages of 18 and 64 were asked how frequently they fit in aerobic or muscle building exercise during the week, if at all. Then, the report's researchers measured those findings against the nationally recommended amount of weekly exercise: 150 minutes of either moderate-intensity aerobic activity or 70 minutes of vigorous aerobic activity, plus muscle-strengthening at least twice. Overall, the report determined that just 22.9% of people, on average, are exercising enough to meet the recommended amount nationally. However, it also found that those levels vary enormously from state to state. The most active state was found to be Colorado, where 32.5% of adult residents claim to meet the guidelines, while 13 other states plus Washington, DC boast a significant number of adult residents who do so. On the other end of the spectrum, Mississippi is the least active state, with just 13.5% of residents making the cut, with 12 other stats falling significantly below the minimum of 22.9%. Here's how things break down. If you’re perplexed why certain states aren’t doing better, the researchers echo the sentiment. The report also found that results vary quite a bit by gender. For example, 28.8% of men claimed to be getting enough physical activity, while just 20.9% of women did. Things also differ depending on what you do for a living, with white-collar workers more likely to get the proper amount of exercise and people in more blue-collar or physically demanding jobs less likely. And while 23% of the population getting adequate exercise may seem like a depressingly low statistic, it’s better than the experts had anticipated. In fact, the public initiative Healthy People 2020 set the goal of getting at least 20.1% of Americans to exercise enough by 2020, which we've already beat on the national level. However, there’s clearly still quite a lot of work to be done if we want every state to match it.